Two dry mixes are available, which employ the finest natural ingredients. The dry mixes contain no preservatives or artificial colors. Dry mixes are hand-mixed in small quantities to insure high quality. These dry mixes are based on the whole wheat pancake flour formulations developed by historic Stratton Flour Mill in the 1920s. 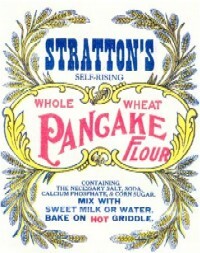 The original pancake flour formulations were perfected in what today is Stratton House Inn -- then the home of the miller. When clearing out Stratton House Inn following the death of the last miller, the recipes were found. Following extensive research to find quality ingredients similar to those used 80 years ago, the famous pancake flour has been reintroduced.